Rabbi Dr Naftali Brawer served as the spiritual leader in congregations in both the United States and the United Kingdom. In his last communal post he served as Senior Rabbi to the Borehamwood & Elstree United Synagogue, one of the largest Orthodox Synagogues in the UK. He is a broadcaster, columnist and published author. He serves on the Chief Rabbi’s cabinet as well as on a number of various advisory boards including the international Jewish Human Rights organization; CCJO Rene Cassin. Rabbi Brawer has been very involved in interfaith work both in the UK and in internationally. In 2008 The Jewish Chronicle listed Rabbi Brawer amongst the 100 most influential people shaping the Jewish community in Britain. In September 2011 he took up his current position as CEO of Spiritual Capital Foundation; a nonprofit organization dedicated to instilling values and purpose in the workplace. Rabbi Brawer’s unique skill is his ability to distill and simplify abstract concepts and to communicate them in a compelling, relevant and inspiring way. Today many observant Jews as well as Muslims are hungry. Muslims find themselves just over a week into the month long fast of Ramadan while Jews find themselves observing the 24 hour fast of Tisha B’Av commemorating the destruction of the Temple in 70 CE. While fasting has always been a component of many faiths the reason behind this practice is not always well understood. At least in Judaism there seem to be two disparate ideas associated with fasting. The first understands fasting as a form of self –mortification, a means of punishing the body so as to affect divine absolution for sins committed. In this school of thought fasting is often joined with other physical privations and mortifications. While still accepted by ascetics this idea lost its hold on the wider population by the start of the modern era. Far more popular today is the mystical notion that fasting is a means towards transcending, if but for a brief time, the material self in the hope of attaining a deeper awareness of the Divine. I’m not sure how many people actually experience the Divine but the notion of at least pursuing it is distinctly more palatable than inflicting self punishment. Fasting is difficult because you can’t ever entirely wean yourself off food. One can, at least in theory, give up smoking cold turkey and never smoke again. The same goes for alcohol, coffee or chocolate. Over time it becomes easier to avoid these substances as the body adapts. The thing with food is you have to keep returning to it and that’s what makes it so hard to give it up occasionally. Philosophically speaking fasting and food present a dialectic in which one is forever vacillating between two points. This is particularly true for Judaism and Islam which also prescribe many ritual feasts. And so it’s a dialectic of feasting and fasting. Fasting teaches a person of faith to maintain a creative tension between living in the real material world with all of its imperfections, compromise and disappointments while at the same time trying to transcend it. Neither polarity is desirable or sustainable in the long term but rather they depend on each other for balance. An exclusively materialist reductionist approach to life is devoid of all spiritual meaning while a wholesale rejection of the material world renders faith irrelevant. Yet as with all polarities one can leverage the inherent tension. Practically this means that a person of faith must navigate a dialectic of advance and retreat. Occasionally retreating from, or rising above, the material reality in the hope of experiencing and articulating an ideal vision of reality. Sustained with this vision however one must eventually advance back into the material, imperfect world to contribute to its betterment. Retreat without a corresponding advance can be very seductive for idealistic young believers disillusioned with rampant materialism and so they throw all their weight against one pole upsetting the delicate balance of faith. This is called fundamentalism. By sitting down to a meal this evening at the end of the fast we discredit such skewed and dangerous inclinations. Our retreat over, we commence our advance, reaffirming our commitment to participating fully in this imperfect, troubled world in the inspired hope of making it just a little more habitable each day. On Sunday I attended a concert at Auschwitz. 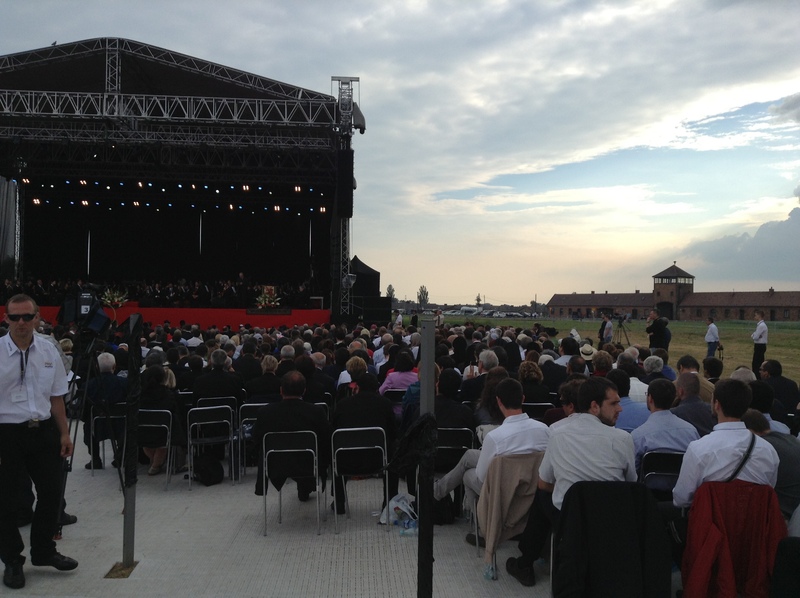 The former Nazi extermination camp was host to over ten thousand people, including dozens of bishops, rabbis and politicians all assembled to listen to the orchestra and choir of the Neocatechumenal Way perform a symphonic-catechetical in memory of and in solidarity with the suffering of the innocents. The Neocatechumenal Way, founded in Spain in the 1960’s in the aftermath of Vatican II is dedicated to Catholic renewal and to improving Judeo-Catholic relations. This particular piece of music, performed by one hundred musicians and eighty choral singers, honours the memory of innocent Jewish victims of the holocaust by invoking the image of Mary crying along with Jewish mothers at Auschwitz and other concentration camps. I had never previously been to Auschwitz. I am unfamiliar with Catholic sacred music and more importantly Catholic theology. I went partly because my instinct told me this was going to be a meaningful event and partly because the indefatigable Lorenzo Lees, one of the key organisers who invited me, wouldn’t take no for an answer. I arrived early and under a blazing sun, I trekked in silence across the vast and bleak expanse of Auschwitz – Birkenau unable to grasp the magnitude of this former death factory. Later in the afternoon a cool breeze brought relief as I listened attentively to the strange and beautiful music of this extraordinary concert. In many ways it was foreign to me; musically, liturgically and theologically. Orthodox Jews eschew orchestral music in worship, we speak to God in Hebrew not Latin and Jews and Catholics have very different views when it comes to interpreting suffering. Yet across this vast audial and conceptual divide I was able fleetingly to appreciate, if not entirely grasp, what these compassionate and thoughtful Catholics were trying to communicate to me in their own language. Often when it comes to building bridges of understanding and reconciliation, be it religious, political or personal we expect the other to conform to a prearranged script that we have in our head. We expect them to use our language and terms of reference. This is often just not possible and it is rarely desirable. We are all shaped by our own perspectives and cultural contexts. Authentic and constructive communication is not about compelling the other to speak in our language but it is rather to listen carefully to the language of the other and to discover within the unfamiliar and discordant notes a deeper commonality that transcends language. For a brief moment I grasped this elusive sense of commonality as Catholics and Jews stood together in the former gates of hell listening to sublime music invoking solidarity, compassion and the universal yearning for heaven. This grey cold Friday morning, my grating alarm clock went off at precisely 6:30. Instead of eliciting the usual resentment, this morning it’s shrill bleeping brought a smile to my face. Its 21st of December 2012 and the world is still here. So much for the ancient Mayan doomsday prediction. I treated myself to a celebratory breakfast consisting of a bowl of thick stove- cooked oats with a tablespoon of brown sugar and a drizzle of quarter-cask laphroaig single malt. It feels good to be alive. It’s not as though I actually expected not to wake up. No sane person I know really believed that the world was going to come to an end. At least not in 2012. Half a century ago it was a different story. During the Cuban missile crisis of 1962 Americans were convinced that nuclear Armageddon was fast approaching. I was not alive then but those who were insist that it was no joke. Last night I just happened to be watching the last episode in the second series of Mad Men. It is set during that fateful week of October ’62. At the end of the episode key characters are saying and doing things they never would have contemplated had they not been convinced that they might not wake up the next morning. Betty Draper takes Don back despite his serial adultery, Pete Campbell reveals his true feelings for Peggy Olson and Peggy tells Pete the truth about the secret child she had. It makes sense. Priorities shift dramatically when time is running out. What was previously unimportant suddenly assumes great importance and what was once significant becomes inconsequential. On a smaller scale we see this frequently with those tragically suffering from a terminal illness. When the end is near one makes the most of what is left. But how near must the end be in order for us to feel this way? We are all going to die one day, some of us sooner than others. Yet no one reading this blog is likely to be alive in 2112. Does knowing that our world will come to an end within the next hundred years make us think or act differently? Probably not. If we had ten years left to live would our priorities shift? Most likely. What about if all we had was a year? Almost certainly. A few days? Definitely. But why? In the infinitude of time what difference is there really between several days, a year, ten years or a century? By dusk it withers and dries up. Or, given the strength, eighty years. They pass by speedily, and we are in darkness. That we may obtain a wise heart. The problem is not that we have limited time. It is that we don’t appreciate how limited it really is. What the Psalmist is trying to say is that if only we had the sense to count our days we would live rich, wisdom-filled, purpose driven lives. In the end it’s not the years in your life that count, it’s the life in your years. So the world has not come to an end. Let’s celebrate our existence by counting each day so as to make each day count. I recently saw a fascinating exhibit at Blain Southern by the East London artists Tim Noble and Sue Webster entitled Nihilistic Optimistic. The artwork consists of piles of junk ingeniously constructed and placed in front of beams of light so as to project realistic self-portrait shadows of the artists against blank walls. The technical aspect is breathtaking. At first I refused to believe that the pile of discarded furniture and electrical wires had anything to do with the realistic human shadow projected on the wall in front of me. Yet, after closer inspection (by shadowing the junk with my own hand and seeing it reflected alongside the artwork) it became obvious; the human shadows were indeed produced by junk. Apparently one of the drivers for making this kind of art is Noble’s and Webster’s fascination with perceptual psychology; the way in which human beings perceive abstract images and project meaning onto them. Perhaps the meaning of the exhibit’s title ‘Nihilistic Optimistic’ is the way in which one might perceive, what is essentially a pile of junk, as a human shadow. It all depends on one’s perspective; a nihilist sees a pile of meaningless junk where an optimist perceives the human form. But what is the human form if not a pile of junk? We are, if one were to take a reductionist or mechanistic view, nothing more than a collection of bones, organs and muscles. The bible itself appears to support this notion when God says to Adam ‘for dust you are and to dust you shall return’ (Gen 3:19.) This pessimistic view of the body is echoed elsewhere in the bible. Yet, the remarkable thing is that when this pile of dust is animated by the spirit or light of God it is able to cast extraordinary images across the canvas of life. As I wandered around the gallery I thought about these three components; light, matter and shadow and it occurred to me that it made a wonderful metaphor for human life. If I stood with my back to the shadow all I could see was a pile of junk but if I stood behind the junk gazing at its effect I saw a larger than life human form against the wall. Reductionists will only see bone, sinew and electrical impulses. People of faith and humanists will perceive that the effect of a human being is so much greater than the sum of its physical parts. Our lifespan is brutally short. Our bodies are, in essence, dust. Life itself however can be extraordinarily meaningful. The reflections we generate as we pass through the infinite expanse of time are no less real, no less significant because of their brief duration. All that exists is right here in the present. So are we. Let us make something beautiful with our lives while we have the time. A fifteen year old rural Afghan girl named Gisa was killed last week allegedly by a spurned suitor because her father turned down his marriage offer. Sadly this is only the latest gruesome story to emerge from Afghanistan. Mutilation and beheading as a means of preserving a family’s ‘ honor’ are not uncommon in the lawless regions of this troubled land. Our initial reaction is one of utter disgust giving way to a sense of moral superiority. ‘How is it’ we ask ourselves ‘that such savages still exist in the twenty first century?’ What human being could possibly equate honour with the violent murder of a member of one’s own family? The moral outrage we feel is a combination of revulsion and self-righteousness. The more primitive the crime the more distant we feel from its perpetrators confirming our own civilised status. But civilization is thin veneer that can be torn off at any time depending on circumstances. Long before Thomas Hobbs’ Leviathan and William Golding’s Lord of the Flies the first century Rabbi Haninah urged his students to: ‘ Pray for the welfare of the government for if not for fear of it, people would swallow one another alive.’ His assertion has particular poignancy when one realizes that the government he is referring to is the Roman colonial power that destroyed the Holy Temple in Jerusalem – a traumatic event that the rabbi witnessed first-hand. Still he believed that any government is preferable to anarchy. We are suitably repelled by the atrocities in Afghanistan not because we are intrinsically incapable of such vile acts ourselves but because we had the good fortune to be born into a society governed and under-girded by the rule of law. The moment that were to slip, all bets are off as to how we might behave under challenging circumstances. Rural uneducated Afghans, are not the only people to display savage behavior in that country. Clean-cut American soldiers committed terrible atrocities at the Bagram military prison, not to mention the crimes their colleagues committed in Iraq at Abu Grahib. Anything is possible when operating in a legal vacuum and the speed with which civilised man can travel back in time is deeply disturbing. Civilisations based on the rule of law are not mere accidents. They are the result of a conscious effort by human beings to compensate for their own inherent weaknesses. The ability to engage in honest and penetrating self-criticism is what sets humans apart and enables them to live decent and meaningful lives. A couple of weeks ago I heard an Orthodox rabbi give a talk about the way in which one ought to approach the characters of the bible. Not surprisingly he invoked the principle of yeridat ha-dorot (‘the decline of the generations’) which posits that each generation is subsequently spiritually and intellectually inferior to the previous one. This principle is first mentioned in the Talmud in relation to rabbinic authority. In tractate Shabbat 112b the late third century Rav Zeira is quoted as saying: ‘If the earlier [scholars] were sons of angels, we are sons of men, and if the earlier [scholars] were sons of men, we are like asses.’ The implication of this notion is that later rabbis are bound by the authoritative halachic opinions of their predecessors. Whether or not this holds true in practice (there are many exceptions to the rule) is the subject of another essay. The rabbi I was listening to however was not invoking this principle in a legal sense but in a much broader context extending to our perception of biblical characters. A cursory read of the bible reveals extremely complex characters that are comprised of both good and evil and whose lives are a constant struggle. Adam and Eve are destined for greatness but they succumb to temptation and eat forbidden fruit. Cain gives vent to his jealously by murdering his brother. Noah walks with God but compromises his dignity after the deluge. Abraham is a man of great faith but banishes his own child. Sarah can be both nurturing and cruel. Jacob dupes his old blind father, cheats his brother and favors one son above all others. Judah commits a sin of passion but then achieves personal redemption through assuming responsibility. Joseph displays great fortitude, faith and discipline but exacts revenge on his brothers. Later in the bible it gets even more complicated with King David committing adultery with a married woman and then having her husband killed and King Solomon who besides his harem of a thousand wives appears at the end of his life to be rather ambivalent towards idolatry. This complexity is what makes the bible not just exciting but more importantly; relevant. It is in the struggles of these men and women that we discover reflections of our own struggles and it is through identifying with the characters that we are able to learn valuable lessons about life. But there is a growing strand within Orthodox Judaism that feels threatened by such a reading. Besides the absurdity of the argument (are there really lower and higher levels of committing deception or adultery?) it undermines the entire relevance of the bible. By rarefying these characters to such a degree they are placed effectively out of reach rendering them irrelevant to the reader who can no longer identify with them. Why is this necessary? Why is it assumed that we will think any less of an Abraham, a Jacob or a David if we knew that they shared our human strengths and weaknesses? Why is it assumed that we would prefer to be guided by examples of uni-dimensional characters over multi-dimensional ones? And finally, how is it that the same strand within Orthodox Judaism that insists on the literal reading of the bible when it comes to say, creation of the universe in six days, can so easily insist that the tales of the patriarchs and matriarchs, where they appear to sin, must be allegorised so as not to leave the impression that they were anything else but perfect? The choice between revering biblical characters and identifying with them is a false one. It’s time we had the maturity and sophistication to recognize this. America has finally chosen its next president and it’s about time too. After a year of relentless campaigning the candidates have collectively spent over a billion and a half dollars, clocked up thousands of travelling miles, addressed hundreds of rallies and kissed numerous babies as they desperately battled for the vote. It is a grueling process and it self-selects the most tenacious, focused and driven of candidates. US Presidential elections are not for sissies. And yet are they necessarily the best way to choose the leader of the free world? While drive, focus and tenacity are qualities needed in a president there are numerous other qualities necessary in a leader that are simply not tested or brought to the fore through the aggressive self-promotion of a presidential campaign. These include wisdom, forbearance, humility, temperance, integrity and authenticity. Ironically those who have these qualities in abundance are least likely to put themselves forward as candidates. And yet it is precisely such individuals who have what it takes to become great leaders. This might be the reason that in the bible almost every successful leader initially resisted the role of leadership. Moses begged God to chose someone else as his messenger, Saul hid when the prophet Samuel declared him first king of Israel, the military commander Gideon declared himself unfit to lead his people’s army, and the prophets- particularly Isaiah and Jeremiah – desperately did not want the job. What makes reluctant candidates attractive potential leaders is their keen awareness of their own limitations combined with the fact that they are beholden to no one but their own best judgement and moral conscience. A far cry from the shameless self promotion of a presidential campaign and its alignment with, and dependency on, special interest groups. While it is neither desirable nor possible to revert to the non-democratic model of biblical leadership appointment, there is something in that model that is worth retaining. Can we find a way of attracting to high office men and women of great ability and character who simply don’t have the stomach to promote themselves relentlessly for over a year? Might there be a way of encouraging candidates of great integrity to enter a process where they can speak honestly and openly about both their strengths and weaknesses? Is there any way we could raise the level of debate so as to attract candidates who are more interested in having a conversation than a shouting match? And can we temper the adversarial tone of electioneering to encourage candidates who are more interested in talking about ideas than putting down their opponent? If we can, we might discover remarkable leaders in the most unlikely places.